The number of home loans available to borrowers has dwindled in the last decade due to the overhaul in our industry. The industry has become more commoditized and each borrower has a couple of home loans available to them to finance their home purchase. Unless you can pay cash when buying a house, the only other option is to obtain financing that’s used to buy the home for you. Home loans were created with the purpose of making it affordable for Americans to buy real estate and be able to get on a payment plan to repay the loan over time and eventually own the home outright. 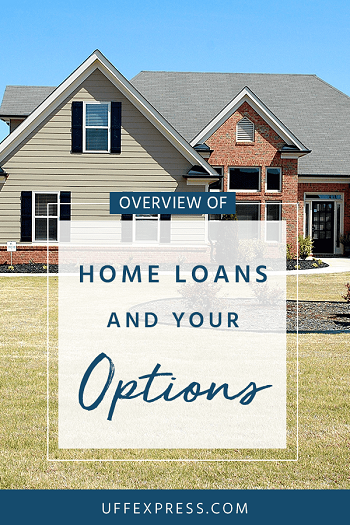 The number of loans and options can be overwhelming, and figuring it all out on your own can be a challenge, but we’ve done our best to give you a decent overview of each of the programs available to home buyers today. Our Home Loans guide below walks you through each primary mortgage program, the benefits of each and some of the downsides to keep in mind. Home loans for first time home buyers have been marketed relentlessly over the past couple of years with the slew of millennial home buyers entering the market. While a first time buyer has EVERY option available to them (FHA, VA, Conventional, USDA, etc. ), there are two primary options available. Which option makes the most sense financially comes down to credit score and overall debt-to-income ratio. The preeminent first-time buyer option is the FHA Mortgage. Congress created the FHA program back in 1934 and it became a part of HUD (Department of Housing and Urban Development) in 1965. Since inception, the purpose of the FHA loan was to help spur the housing market and make home ownership affordable. While FHA comprises about 10% of applications nationwide, they are the largest insurer of mortgages with over 47 million mortgages since 1934 and currently insure nearly 8 million properties. Lower rates – given it’s a government-backed loan, the FHA program generally has lower interest rates than it’s counterpart. It’s not also as credit sensitive, meaning that borrowers with fair to good credit don’t get significantly higher rates as they do with other loans. Lenient credit score requirements – with a minimum FICO requirement of 520, it’s one of the best options for people with poor or fair credit. While all factors are considered in loan approval, most lenders require a 580 credit or better to qualify. Low down payment – the minimum down payment for FHA is 3.5% of the purchase price. If you put 5% down you get reduced mortgage insurance, and if you put 10% down, the mortgage insurance falls off after 11 years. Mortgage Insurance Premium (MIP) – the MIP on an FHA loan is used to fund their program and insure FHA against default. The benefit though is that the monthly cost to the borrower is based on the loan amount (.85% of the loan amount per year, or .80% if you put 10% down). This is a stark difference compared to Conventional loans that offer PMI. PMI is credit score driven which means premiums can be significantly higher for borrowers with lower credit scores. Significantly more flexible guidelines – the debt-to-income ratio on FHA loans can go to a maximum of 57% whereas Conventional only allows up to 50%. Multi-family homes – assuming it’s your primary residence, Conventional loans require a larger down payment if you’re interested in a 2-4 unit property. FHA however keeps their minimum down payment the same at 3.5%. This makes FHA a very attractive option if you’re considering buying a multi-unit house, living in one unit and renting out the rest. Upfront Mortgage Insurance Premium (UFMIP) – FHA has an additional insurance premium outside of the monthly mortgage insurance you pay. Conventional loans don’t have this fee at all, so it should be considered when determining if this is the best choice. The UFMIP is 1.75% of the loan amount. This fee CAN be rolled into the loan at closing, so it’s financed over the life of the loan which makes it more reasonable as it’s not paid at closing by the borrower. Property requirements – with all government loans (FHA, VA, USDA) there are a set of minimum property requirements set by those programs. When the appraiser goes to value the home, they’re responsible for looking to see if the home abides by the property standards set by FHA. Distressed properties or items need of immediate repair likely won’t qualify for FHA financing. Simple things like peeling paint on the exterior of a home (or shed) can be flagged. If any item is flagged by the appraiser that means it’ll have to be fixed prior to the lender being allowed to close on the loan. Monthly Mortgage Insurance Premium (MIP) – unlike Conventional loans where the PMI falls off once you get to 78% loan-to-value, MIP stays on for the life of the loan unless you put 10% down. While this is a ‘con’, MIP can be a benefit given that it can sometimes be significantly cheaper than PMI on conventional loans. Due to the lower rate on FHA loans and sometimes the cheaper mortgage insurance, it can make the most sense to start off on an FHA loan and then refinance to a Conventional loan once you obtain 20% equity in the house (which would allow you to remove PMI). Student loan payments – FHA does not honor income-based repayment plans and requires lenders to count 1% of the outstanding student loan debt as the monthly payment when factoring the debt-to-income ratio requirement. So while it does have more lenient guidelines, this can be a hindrance for some borrowers with significant student loan debt. Loan amount – the FHA loan program offers a lower maximum loan amount than Conventional loans. FHA loan limits are $314,827 in most counties throughout the country. That limit increases for 2-4 unit properties and in some high-cost counties. When you're ready, we've made it safe and easy for you to apply for an FHA Loan online. The Conventional 97 Loan first time buyer program is a newer option. While it’s been nationally marketed as the ‘first time home buyer loan’, its more specific name is HomeReady (Fannie Mae) or HomePossible (Freddie Mac). In 2015 the Federal Housing Finance Agency required that 24 percent of single family home loans acquired by Fannie Mae be affordable to low-income families. Because of this the HomeReady and 3% down options were dawned. While this program is like the standard 5% down Conventional loans, it does have a few minor benefits. Lenient appraisal requirements – unlike FHA, Conventional loans rarely flag items on an appraisal. Cancellable mortgage insurance – the PMI (private mortgage insurance) on a Conventional loan does fall off once you obtain 78% loan-to-value based of the original appraised value of the home. Since this cancellation is based on the original value, you’ll likely have mortgage insurance for 8-11 years on a Conventional loan (unless you pay more than the minimum payments). Reduced Private Mortgage Insurance – if you qualify for the income-based 3% down option, the mortgage insurance coverage is priced at 25% as opposed to the 35% on the standard 5% down option. This does provide a great cost savings compared to traditional Conventional loans. Reduced Interest Rates – Fannie Mae requires lenders to offer a reduced interest rate for qualifying borrowers that meet the income-based requirements. Credit sensitive – all conventional loans require a minimum FICO of 620, and borrowers with lower FICO scores do get significantly higher rates than those with higher scores. The same is true for Private Mortgage Insurance. While the coverage percentage is lower (25% as opposed to 35%), PMI is also priced based on credit score, so the lower the score the higher the premium. Income Restrictions – in order to qualify for the reduce interest rate and PMI, your income must be meet the area median income (AMI) or the property must be located in a low-income tracts in which case there is no income restriction. To search see the income limitation for a particular property, use Fannie Mae’s tool: https://homeready-eligibility.fanniemae.com/homeready/. If your income exceeds the restrictions, you can still qualify for a 3% down option, but you do not get the benefit of the reduced PMI or interest rate. Tougher to qualify – as with all Conventional loans, the debt-to-income ratio cannot exceed 50% and in some instances is capped at 45% depending on credit score. When it comes to home loans for first time home buyers, FHA and the Conventional 3% down option are both great. If you have a large amount of student loans then the Conventional mortgage might be the best option, whereas if you have under 680 (or sometimes even 700) credit the FHA home loan likely would offer the best rate and lowest overall payment. Accounting for nearly 75% of mortgage applications nation-wide, a Conventional Mortgage secured by Fannie Mae or Freddie Mac is the standard of home loans. Private Mortgage Insurance (PMI) is waived at 80% loan-to-value. Many previous homeowners buying new homes can put a sizable down payment on a new home purchase and therefore can avoid mortgage insurance entirely with Conventional loans. Also, many Americans refinance to a conventional loan (from an FHA loan) once they get to 20% equity in order to eliminate mortgage insurance. A Conventional Mortgage is the only option when buying a 2nd home or an investment property. FHA, VA, and the other loans require that the home you’re buying is your primary residence. First or second-time home buyers opt for a Conventional loan simply because the mortgage insurance can be cancelled once 78% loan-to-value is obtained. While cancellable mortgage insurance is a benefit, if you put the minimum of 3-5% down, the reality is you’ll still have mortgage insurance for nearly a decade assuming you make the minimum monthly payment. Therefore, the odds of you living in the home or not refinancing within 10 years is very slim, so the cancellability option shouldn’t always be the primary factor when determining if this is the best home loan for you. Cancellable or No PMI - to learn more about PMI, read our What is PMI article where we discuss the cost and how to avoid it. Minimum property requirements – conventional loans have few written property requirements that appraisers must be on the lookout for. Student loans – unlike FHA loans, conventional loans allow lenders to honor the income-based repayment plans when calculating debt-to-income ratios. Higher loan limits – while FHA loans are capped at $294,515, county loan limits for most single family residences are $484,350 (and higher for multi-unit or in high-cost counties). Credit Score sensitive – despite the benefits, interest rates and mortgage insurance are largely credit score dependent. A general rule is that if you have below 680 FICO and are putting less than 20% down, then the FHA Mortgage may offer a lower monthly payment. Stricter debt-to-income ratio requirements – the maximum DTI on a conventional loan is 50% and, in some instances, can be as little as 45%. Conventional home loans are the ideal fit for somebody with excellent credit, a large down payment or purchasing a 2nd home or investment property. If you have good credit (660-700) and have a minimal down payment, FHA and Conventional loans should both be considered. The VA Loan program is for qualifying Veterans who served in the US Armed Forces. Generally, you need to have served 2 years active duty, 6 years in the guard/reserves or have received a disability rating by the VA. While there are some downsides to the VA loan, in most instances if you’re a qualifying Veteran the VA loan is by far-and-away one of the best home loans out there. Competitive interest rates – not only are the interest rates more advantageous than most conventional loans, they’re not as credit sensitive either. Meaning, if you don’t have perfect credit your rate only increases moderately. Lowest overall monthly payments – with no mortgage insurance and low rates, it’s hard to get an overall mortgage payment lower than what VA loans offer. Higher loan limits – like Conventional loans, VA will insure a loan amount up to $453,100 in most counties. VA Funding Fee – unless you’re a disabled Veteran, the one fee VA charges is called the VA Funding Fee. It can range anywhere from .5% to 3.3% of the loan amount. It can however be financed into the loan in nearly all scenarios. Residual Income Calculation – this is an extra calculation above-and-beyond the standard debt-to-income ratio calculation the other loans require. This calculation attempts to analyze a Veterans after-tax disposable income and sets minimums as to what it must be. Taxable income, family size (including dependents), and the home square footage all play a factor into this calculation. Minimum Property Requirements – like FHA and USDA, the VA has standards their appraisers must be on the lookout for when appraising a property. Safety hazards and minor things like peeling paint on the exterior of the home can be flagged and required to be fixed before the loan can close. The USDA Rural Housing Loan program was created to help low- and moderate-income families attain affordable housing in rural areas. While this program offers a great benefit in allowing no money down and drastically reduced mortgage insurance, it is one of the more complicated and difficult home loans to qualify for. No Loan Limits - nearly every program in the country has loan limits, however the USDA has no loan limit, meaning you can borrow as much as you're able to qualify for. Reduced Mortgage Insurance – for USDA loans the mortgage insurance is called a guarantee fee and it is only .35% of the loan amount annually. That’s then divided by 12 and added to your monthly payment. This is starkly lower than the .85% from FHA and the likely higher amount from Conventional loans. Competitive rates– like with the other government-backed loans (FHA and VA), the interest rates are highly competitive, and they do not fluctuate as much based on your credit scores like a conventional mortgage. Low payments – with the competitive rates and affordable mortgage insurance (or annual guarantee fee), the payment on a USDA loan will be lower than most other options. Low Debt-to-Income guidelines – of all mortgage options, USDA has the most restrictive ratios. In order to qualify with their automated underwriter system (the easier route) your housing payment cannot exceed more than 29% of your gross income and your overall debt ration (housing payment plus all minimum payments on credit) must be below 41%. Conventional loans allow up to 50% while FHA loans allow up to 57%. USDA will allow you to go higher with ‘compensating factors’ but this is a manual underwrite and likely will have to be approved by the USDA themselves. In these instances, the ratios can go up to 34% for the housing payment and 46% overall. Minimum property requirements – as with the other government programs (FHA and VA), USDA also has similar property standards. If the appraiser flags anything wrong with the home then it’s required to be fixed prior to closing. This can be as minor as peeling paint on the exterior of the house but any distressed issues with the home likely could be required to be repaired. Higher FICO requirements – USDA technically has no minimum credit score requirement, but anything under 640 is a manual underwrite, which means you’ll need compensating factors and for the USDA to sign off on your loan. While USDA loans are challenging to qualify for, if you fit the criteria then they’re an excellent option and we've made it easy for you to apply for a USDA Loan. If you’re self-employed and looking to purchase or refinance a home, then you have your work cut out for you. Great loan officers will help you significantly ease the process, but if you get somebody that doesn’t know what they’re doing or what documents are required, then it’s going to be a long and arduous process. All the loans mentioned above – Conventional, FHA, USDA and VA – all allow self-employed borrowers to qualify. There is no special or specific loan program solely for self employed borrowers, but there are some that are easier to qualify than others. For more detailed information read more about the self employed mortgage. As a standard rule across each program, your business must be operational for a minimum of two years and you need two years’ worth of tax returns with the business income filed (whether Schedule C on your personal returns, or separate business returns where you get a K-1). Conventional loans may allow for you to only supply 1 year of tax returns, but evidence of a 2-year history is still required. Manufactured home loans have their own seperate guidelines. Here at United Fidelity Funding, we offer financing options for traditional single-family or multi-family homes but also for manufactured homes. Interest rates on manufactured homes are higher than traditional single family homes or townhomes. Manfauctured home loans often do require some additional costs, such as an engineer report to verify they meet the HUD permanement foundation guidelines. It's also important to note that a true manufactured home must be built after 1976, be permanently affixed to a foundation and have the HUD tags within the home to verify it meets building code requirements. Choosing between the various loans is exceptionally difficult, and as a borrower you will have to rely on your loan advisor to help guide you. Home loans are all we know. Not only is it our job to analyze the loans for you to find the one that best meets your goals and financial situation, but we also help walk you through the entire process of buying a house, from start to finish while focusing on eliminating as much of the stress and worry as possible.